UTown is a new campus for the National University of Singapore (NUS) and opened it’s doors to Students a the start of this academic year in August 2011. It is located close to the NUS main campus, and although separated by a large trunk road, both campuses are joined via a vehicle and pedestrian bridge. UTown has been developed to create a new educational hub that includes teaching facilities, study facilities and residences, for both UG and PG students. It is home to a resident population from over 60 countries and is based in some measure on the collegiate style of the Universities of Oxford and Cambridge in the UK. Although much accommodation is still under construction, UTown has already established itself as a lively intellectual, social and cultural environment that puts excellence in teaching and learning at its heart. My meeting was scheduled to start at the Educational Resource Centre, located at the heart of the campus and which is the place for students to interact, have access to a wide range of technology including a high level of support in using that technology, and spaces to collaborate. It is a completely revolutionary concept for the University, as all other learning and teaching spaces for students are held and managed by individual schools and faculties. This is the first opportunity to create a pool of centrally managed spaces, equipped to a common standard and delivering new standards of support to the students and staff. As I arrived quite early for the meeting, I started to explore and soon found the “Learning Café” which was open and serving coffee. The Learning Café consists of 2 areas, a large covered external area and a more traditional café with a Starbucks outlet serving the usual range of drinks and snacks. Although it was still quite early, a number of staff and students were using both areas. 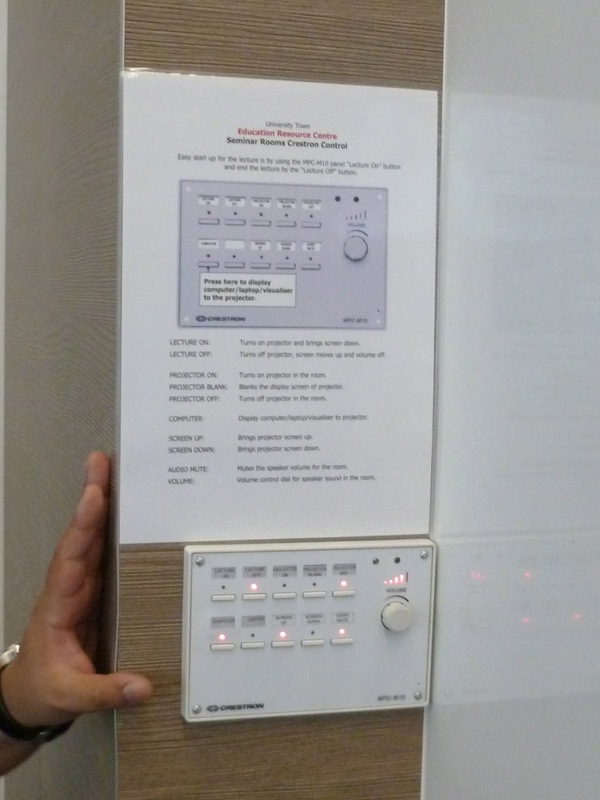 Although there were some MACs provided in the space, most people were using their own devices, plenty of power had been provided for this purpose. I was delighted to find that my host is a graduate of Aston University, and knows Birmingham very well. My host is the Director of the Centre for Instructional Technology, which includes all aspects of IT Services. The Audio Visual function is part of the Centre, but is kept as a separate and distinct team, providing key AV services to the ERC and it’s facilities. We were joined by the AV Manager, (who I noted has a BA in TV & Film). 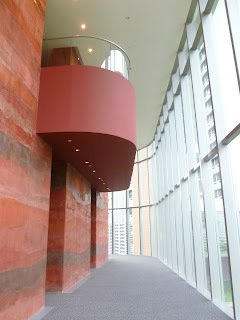 The ERC is a really interesting design, and I found that we were traveling through internal and external spaces almost seamlessly. Everywhere is covered, to protect people from the rain, but a room would lead to a balcony and back to a room again. This is a 200 seat lecture theatre which has been built using recycled wood for the internal walls, the design and construction of UTown has been undertaken to be as environmental friendly as possible as is reported to be the University's "greenest building". 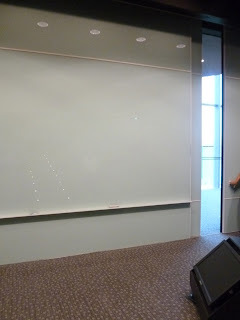 This room has 3 projectors, for dual projection and for when in use as a theatre for video screening. 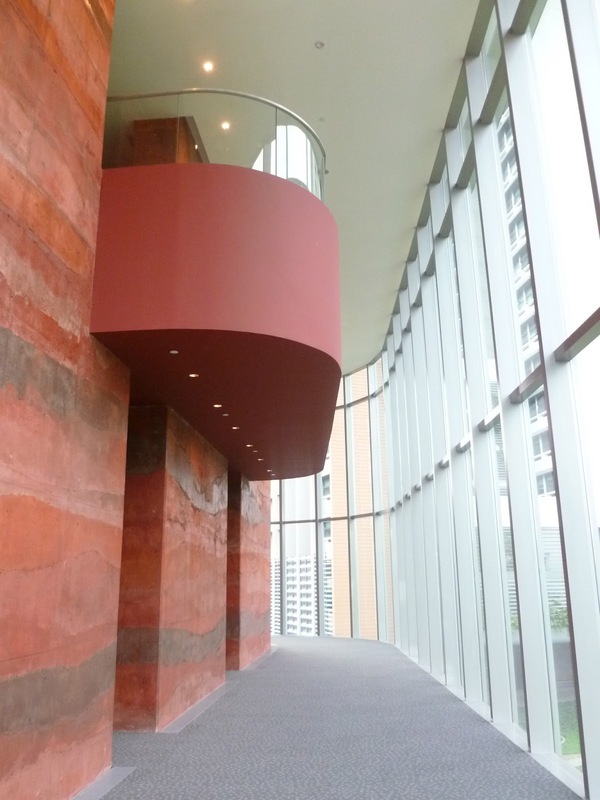 Two of the panels can slide out of the way to expose windows which open up the room to the corridor outside. The design of the building has had to accommodate 3 very old trees which were included at the centre of the building, unfortunately, during construction, one of the trees was then struck by lightening and lost despite the care taken by the design team. The wirelessly enabled study consists of a large number of individual study and research spaces in a quieter environment than those of the social and collaborative spaces. The Education Resource Centre has two Computing Commons. One with PC and one with Macintosh computers, both of which are all open to NUS Students 24/7. Each of these spaces has it’s own unique and distinct designs, both include a range of breakout spaces and study rooms. The PC Commons is housed in a very large space with generous space to enable students to reconfigure loose furniture to suit them. Other than the project rooms around the internal edge of the room, there are no permanent partitions to divide the space. Rather, extremely nice and interesting structures have been created to provide semi-private collaborative working spaces. Collaborative rooms inside the "Birdcages"
The MAC Commons also combines project rooms, generous spaces to work and movable furniture. Again, a range of collaborative pods have been provided using free standing screens. Movable furniture taken to the comfy window seating. 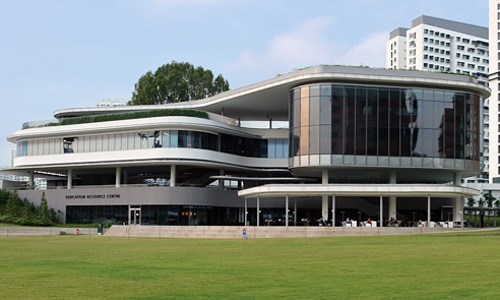 The XChange is the on site office where NUS IT Care support is provided for the whole of UTown. The IT Helpdesk is staffed during “normal” working hours and is located at the entrance of a suite of facilities to provide students with access to develop their multimedia and video projects in a professional setting. The Suite includes a Presentation space that doubles up as a Video Recording studio and a 45 seat Viewing theatre. It is easily convertible as it has a bank of retractable seating. The presentation space is supported by an adjoining Visualisation Suite for audio-video post production and documentation services. For Students who want to prepare for presentations, do voice overs etc. 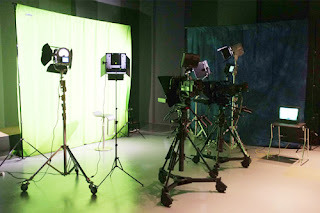 there are two recording booths equipped with video, audio and teleprompter recording facilities. The staff in the XChange provide training and support to students using the facilities. 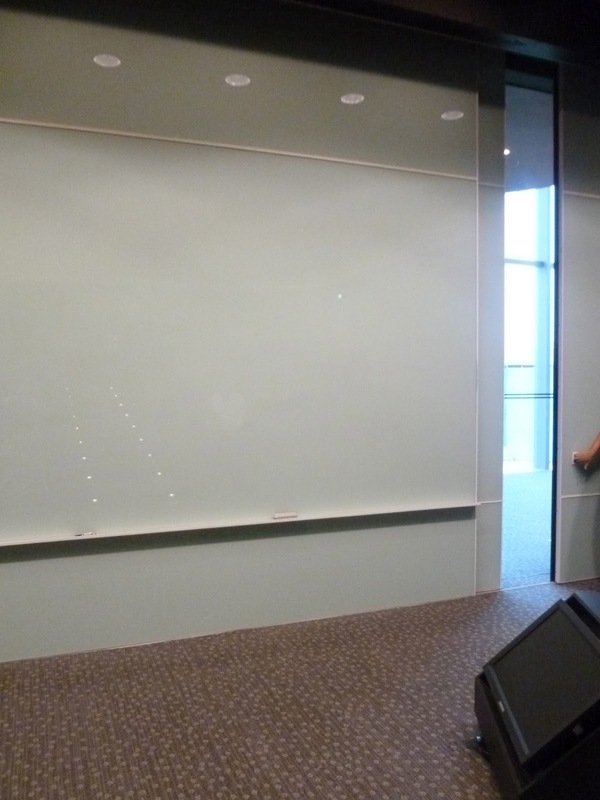 Only one picture of the presentation suite from the web! The Active Learning Seminar Room: A technology enhanced seminar rooms set up to support project and enquiry based group discussion and class presentations. although technology rich, these rooms can also be used without technology. confidence monitor for the teacher. This seating enables the layout to avoid the ubiquitous column! These chairs also give staff a range of options for layouts to suit both teaching and group discussions. There is just so much to see and talk about on this new campus, that I can’t cover it all, but there is one last, innovative feature that I want to share. Teaching staff at UTown are often moving between campuses to teach, so in recognition of this, a new “Faculty Lounge” has been created. This is a dedicated space for staff to use between lectures and includes comfortable seating, space to interact with colleagues, a kitchen and space to use computers. At the end of this tour, I was taken to visit the Main Library on the main campus, followed by a trip to the beautiful heritage building in town which is the home of the Law Faculty, these are stories for another day. They have got the node chairs!!!! I love it....from all the places you have visited this my favourite!!! Fantastic....10 points for Singapore! Hi Maria, it is pretty special, and so much more to share with you when I get home!! En iyi ofis koltuklari mı arıyorsunuz? Çeşitli renk ve tasarımlarda rahatınız ve verimliliğiniz için çok çeşitli ergonomik ofis sandalyeleri bulunmaktadır. Doğrudan fabrikasi fiyatına alışveriş yapın!